When two lovers are going to get married, they start thinking about what can make their wedding really special. Modern couples don’t follow past traditions. Every couple in love wants something original. One of the most unusual ways to show your love to each other is to get tattoos. Many are not so bold or, perhaps, not confident in themselves, and they wear T-shirts with an image of a loved one. But a tattoo is a really unforgettable, in the literal sense of the word, symbol of love that doesn’t pass over time. Joint tattoos for lovers may be of various styles, meanings, and ideas – from traditional and completely simple to funny and touching images on all other parts of the body. In addition, not everyone can wear wedding rings on a finger because of the nature of the activity or because of an allergy to precious metals. In this case, a tattoo is an excellent way out of the situation. And besides, you can’t take it off your finger at the bar, wanting to appear single when meeting a pretty girl or boy or while using a Russian video chat. 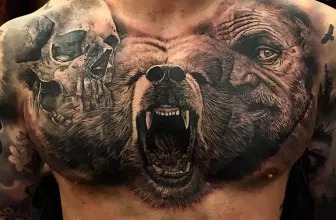 One of the most popular variants of tattoos is two images that are folded into a single mosaic image or simply acquire a special meaning if they are combined. Lock and key. This is the most common option for paired tattoos. At the same time, there are so many variations and styles. You can choose small tattoos or large pattern with many details. The main thing is to find a tattooist who performs work in the style close to you and shares your idea. King and queen. This is another popular tattoo theme for lovers. You can give preference to both monochrome sketches of playing cards and colored cards in a new style with roses and ribbons. For daring people, there is an option with their own portraits or names. Marine life. 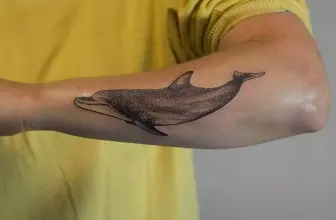 Small tattoos in the form of an anchor and steering wheel, fish, and other marine attributes will suit the fans of the marine theme and old-school style. The same tattoo will be a universal option for lovers. When you are together, your tattoo designs will talk about mutual feelings and loyalty to each other. When you are at a distance, your tattoos will look like independent and complete pictures. Such tattoos are usually small because small pictures are more personal. Watercolor tattoos. 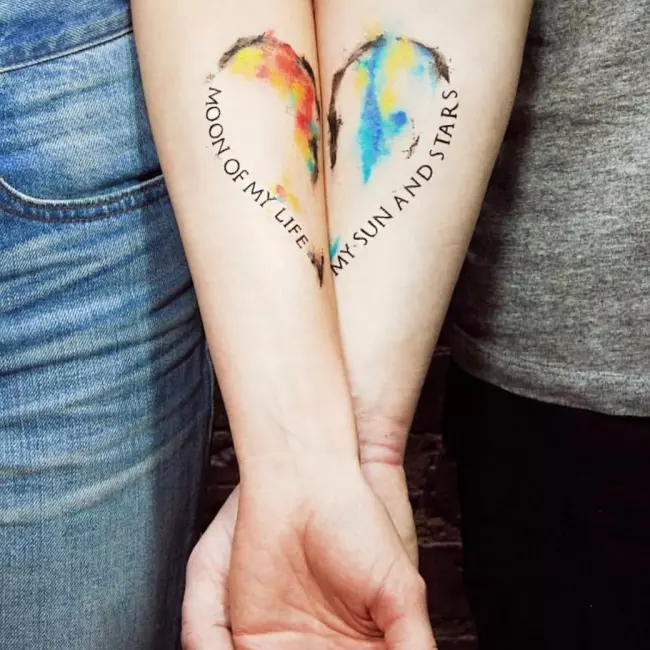 Fans of watercolor tattoos may come in the form of small feathers, which will indicate the lightness and sublimity of the feelings connecting a couple. Animals. If lovers want to portray the same tattoo in the form of animals or birds, then it is better to choose representatives of the fauna that symbolize love, family, and fertility: a horse, a pigeon, a deer, a ladybug. You can choose tattoos with animals in the same style, for example, a wolf tattoo (which, by the way, symbolizes nobility and dedication), a fox tattoo, a cat or dog tattoo. Flowers. In the world of flora, tattoos embody love: white and red roses, red tulips, lilac, and anthurium. It will be symbolic to have flowers on your body that are related to your relationship as identical tattoos. Tattoos in the same style, as well as tattoos with a similar theme, will suit couples whose tastes generally converge; however, the uniqueness of the pattern matters. Such tattoos are endowed with individual meaning, and together they acquire an even deeper meaning. Celestial bodies. A decent variant may be a tattoo of the sun, moon, star, or planet. Movie heroes. You probably have your favorite movies, books, or games. 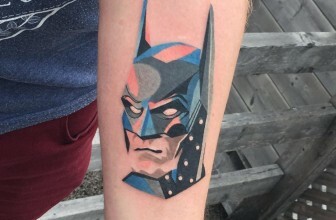 Use your imagination and make a tattoo with your favorite heroes.